Everything should be ready to ship by the end of next week ! ...I still have some left. If you still have some left, I'm in. Sending you a pm. I just got the parts back from the machine shop ! They are perfectly machined ! I'm sorry for the longer wait than expected, but I had some problem with them... I had to machine twice as much parts to fit the BB this time ! Looking forward to these shipping. Any ESD? Nice work Ben. I'd interested in the next round of shifters. Keep me posted. I have some shifter cores. But it won't be until July ! I would like to thank everyone for your trust ! Do you have tracking information yet? Excited to get this in and installed! I thought I already gave you your tracking number? Mine was tight also. Too igh to be smooth. Was it a drag or the bearings didn't fit at all in the buckets ? Everyone that was in the first round of shifters, if the bearings don't seem to fit, don't force them inside ! Tell me, I'll fix it (I think I know why but I'm waiting to get Dwight's shifter back). put me in for the next round as well. Ok, every shifter has been sent, you'll get the tracking number right now. The new round of shifter won't have the same problem. I'm in CA, got mined today. That was fast, can't wait to get a chance to install it this weekend. My original question was not about the shifter ends fitting into the buckets, but getting the new shifter into the plastic OEM assembly after removing the original. 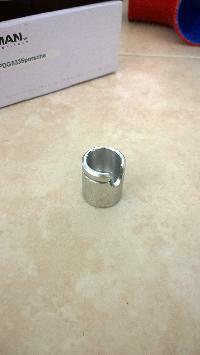 You insert the long end in first and the the side pin into the bushing....it is very very tight....or an I missing something ?? Oh, I have to remember ! The easiest way is to do it with the whole assembly out of the car. The way I did, is that I held the shifter in place, with the side pin in the lever, and slid the two buckets through the assembly and over the bearings, then put the clips. Then finish by tightening the set screw gently (there is no need to use a lot of force here ! ), and tighten the locking nuts. It should work by doing so.